Profit Squad is a premium matched betting service that will help guide you through your first matched betting experience. If you’re not familiar with the term matched betting, you can read our full guide here. If time is not on your side, then matched betting, in a nutshell, is a way of earning a risk-free profit with betting. This can be achieved by betting on both outcomes during an event, so you don’t win or lose the bet. However, by doing this, you’ll unlock a free bet with the bookmaker. You can then use this free bet and apply the same principle, turning it into taxfree profit! Profit Squad was founded by Ben Perchard and Joe Hawes in August 2015. Since then they have made a name for themselves for all the right reasons. Their main aim is to create a user-friendly, highly competitively priced matched betting service with excellent customer service. 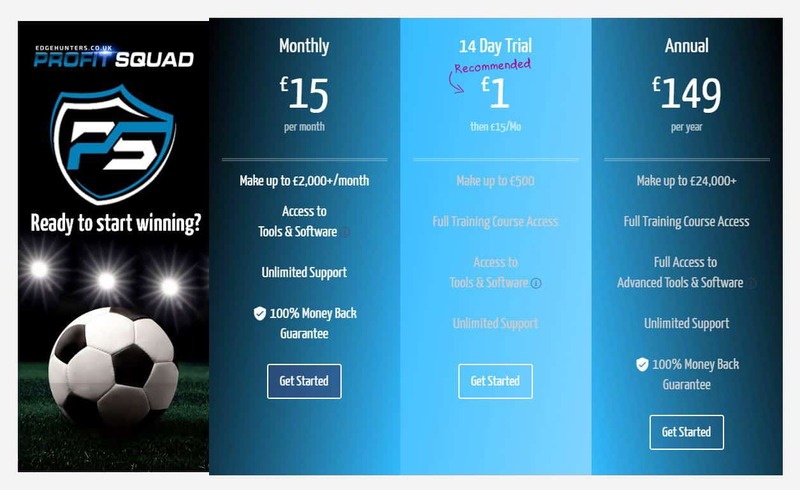 Unlike other betting sites, Profit Squad does not offer a free trial but a minimum subscription fee of £1 for 14 days with full access which can extend to monthly, quarterly and annual packages. The pricing for the renewed account cost £15/month. However, if you sign up as a member, you will get the option of £39.99 quarterly, and you can also subscribe for £149 annually. This gives the user an opportunity to try all the tools and gain valuable knowledge of how the service works. If you did decide to go for the £1 trial, you could quickly have acquired enough profit to pay for a quarterly subscription fee. Even if you are a newbie, the Matched Betting service provides all information and powerful tools to help you through the process with full access to all the features for 14 days by which time, you would have enough experience to do without the help. Once you are signed in, the site provides full access to the comprehensive guides which includes training through videos and write-ups about the process of match betting. These guides and instructions are especially useful for beginners, and they contain instructions for the match betting software and tools which are all inbuilt in the site. TRAINING: Profit Squad delivers training for the customers through short, clear and easy to digest videos and text guides. These videos train the members to use risk-free betting to their advantage and earn maximum profit with simple steps. The instructions are in the bettor’s point of view, so they are valuable and informative even for users who have no clue about the match betting services and tools yet. NUMEROUS STRATEGIES AND OPTIONS: Currently, there are 50 varieties of sports categorised into three sections, each for beginners, intermediate and advanced bettors. TOOLS & SOFTWARE: The site provides links and software of professional tools that can help you convert, keep tracks and manage all your activities, expenditures and profits. They also offer software that can help you crunch numbers and remove the risks in each strategy. Manual search and comparisons are entrusted to the software suite while you concentrate on making the profit. FLEXIBILITY: Whether you have limited time or the whole day to invest in Profit Squad is ideal for both. Learning the trade takes less than an hour, so spending your time to improve your knowledge and skill to strategise your bets better is advised. The process is flexible, and it is entirely up to you to decide how much effort, money and time you want to put into it. The service offers a daily schedule that helps you quickly find open opportunities for a profitable bet. Since these openings usually last only for a day, Profit Squad selects the best opportunities that are a sure-win and compile them into one list and provide instructions on how to turn it into a profit. 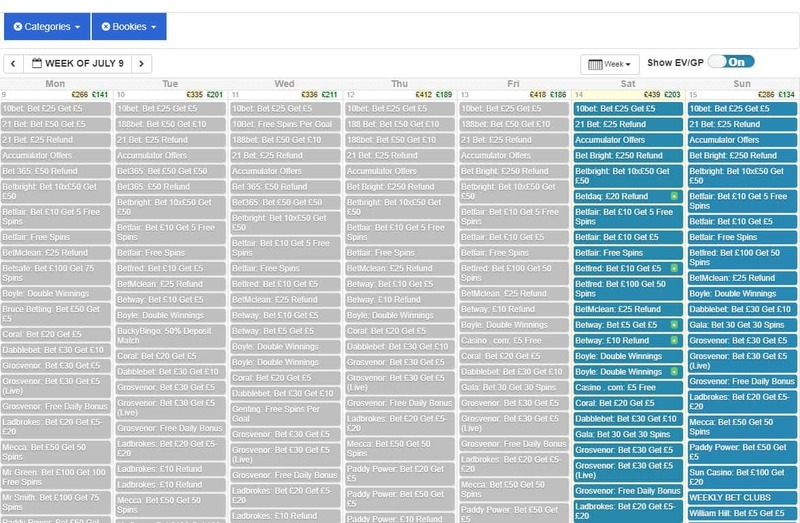 Using the Profit Squad built-in calendar also assists the users to organise their strategies and shows the potential profit for each offer accomplished, giving the user an exact count of how much they will be gaining from each proposal. The calendar is easy to use, and simple to grasp as the instructions, discussion and question forums appears when you click each offer that you would like to take. Keeping track of all your activities, every profit you make and every bet or offer you take is significant. 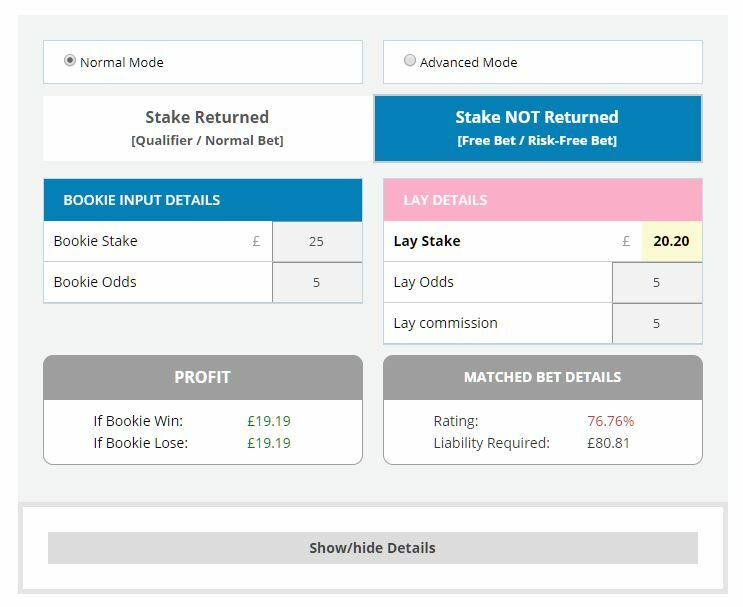 Most sites provide profit trackers because technology has now replaced those days of manually maintaining a spreadsheet to monitor your matched betting process. When the bettor completes an offer, you can click the “complete” button which takes you to the app where you manually record your profit for that offer. These results are then shown in a graph every month. Profit Squad is a better tracker as compared to other sites because you can edit your entries when you make a mistake. It shows the profit you earn from calendar offers, permanent offers and your total gains. Although sign up proposals do not show in the graph, they appear on the left top of the figure and all your profits are monitored and displayed on the graph chart. The downside of this tracker is that it does not show details of the event or whether you lost on the bookmaker or won the bet on the exchange. Oddsmatcher helps you to compare your odds against the odds available at the betting exchange. It scans all bookmakers for their odds and compares them. Profit Squad Oddsmatcher can be used as many times as you need once you have signed up and ranks the matches in order of how profitable they are to bet. Alternatively, you can even try the features when you sign in for your £1 trial so that you can get the hang of the software. It is very efficient because as soon as you click the refresh button, it will refill for all the bookmakers, scan them and bring you all the most profitable bets that you can place. You can also limit the different sports and choose your games by applying the filter with the click of a button and refresh all your results to bring up only the games you want to bet. The most effective strategy for a good bet is knowing how to do the math. Profit Squad offers you built-in calculators that not only help you with calculating your profits but also shows you how much to bet and the exact returns no matter what the outcome. There are two ways to access the calculator in Profit Squad. One is through the toolbar, and the other is through the Oddsmatcher. This software relieves the user from having to open multiple tabs and eliminates the need to log in to another site manually. By using Profit Squad calculator, you will be able to view the potential profits on free bets, standard bets and liability, find out how much you have to lay and back. You can also adjust the figures if the odds change and have a clear vision of how your bets disperse should you win at the exchange or the bookmaker. It is a simple tool that solves all your complicated calculations. One of the best features of Profit Squad is the support system that the site offers in its forum. There are numerous other bettors at different levels, PA staff and moderators to keep the user informed and find help whenever needed. Members are continually sharing tips and notifications of great bets and markets through discussions, and you will be able to find someone offering suggestions for all your queries throughout the day. Gloating is considered detrimental, so beginners are comfortable even when winning smaller profit because any profit is a profit. Profit Squad is genuinely efficient and saves a lot of time to find suitable matches at the tip of your fingers. It has made finding the right tools and strategies for maximum profit much more straightforward, and the pricing for membership and signing up is very competitive compared to other matched betting sites that offer a free trial. Profit Squads tutorials are simple to follow and will guide you from start to finish. This service is perfect for newbies and experienced matched bettors alike. The new betting offers are regularly updated, and the site offers a massive list of strategies from sign-up offers, accumulators, both-way Dutching to experimental and advanced bettors. If you are a newbie or just checking out the site, spending £1 on a service, you’ve never heard of might seem a bit daunting at first. However, if you are willing to learn the process, this could be a legitimate way of earning a second income online. It doesn’t matter if you are already signed-in to other bookmakers, you can still make a considerable income at Profit Squad. 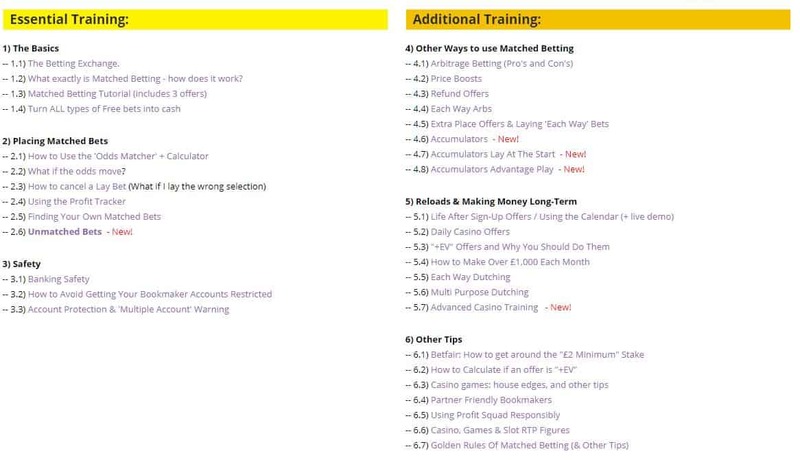 All in all, matched betting through Profit Squad is easy to learn, it shows real insight into how it works, keeps a note of all bets and it is risk-free so why not give it a shot?